With Hurricane Irma still fresh in the minds of many Floridians, Hurricane Michael made a ferocious landfall as a high-end category 4 storm near Mexico Beach on Oct. 10t, 2018. Michael was the strongest storm on record to strike the Florida Panhandle and was the strongest hurricane in terms of maximum sustained wind speed to strike the contiguous United States since Andrew in 1992. At least 60 deaths were attributed to the storm. 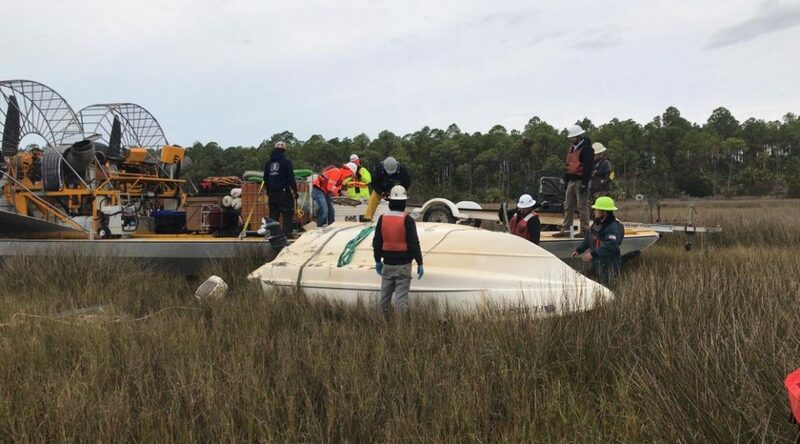 On Oct. 18t, FWC and the U.S. Coast Guard received a FEMA mission assignment under ESF-10 (hazardous materials) to remove the pollution threat caused by displaced vessels within state waters, similar to the response after Hurricane Irma. The total mission assignment funding is $18,600,000 and ends February 16, 2019. 1,363 displaced vessels were identified by aerial imagery and field assessments. The mission is nearly complete, with 543 targets closed out of the 544 vessels deemed as requiring action. To date, 24,381 gallons of pollutants have been recovered. A vessel being removed from a sensitive site. 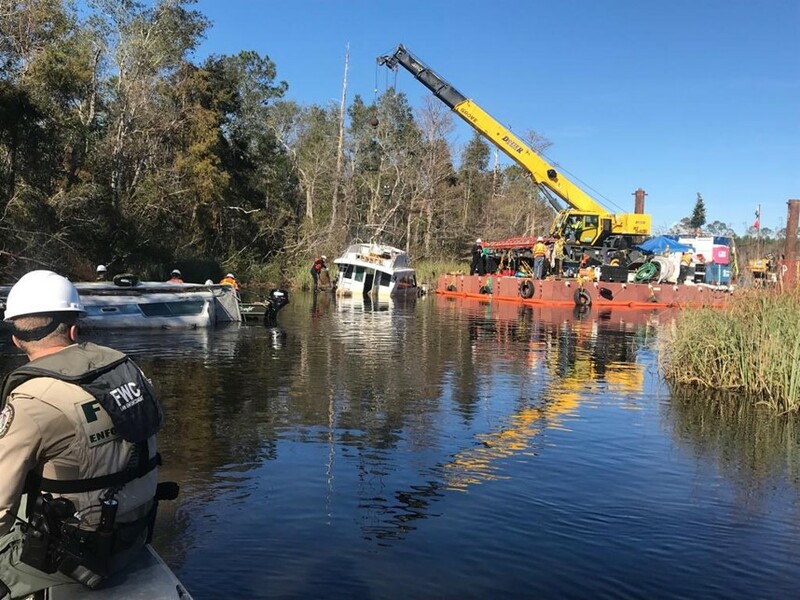 FWC Law Enforcement staffed the Incident Command Post and provided uniformed officers and patrol vessels at all recovery operations. FWRI led the Environmental Unit (EU) which identified 341 targets in environmentally sensitive areas such as salt marshes, seagrass beds, aquatic preserves, historical sites and other critical habitats. Responders used ESRI Collector and Survey 123 applications to track and document progress throughout all phases of the response. The EU established a set of Best Management Practices and provided training to the vessel response teams to protect wildlife and minimize the impacts during recovery and removal operations. Hurricanes are a reality of Florida and FWC takes these operations with the respect they deserve.